Thumb rule is a general principle that gives practical instructions for accomplishing or approaching a certain task. Typically, rules of thumb develop as a result of practice and experience rather than from scientific research or theory. For example, required covered area is multiplied with thumb rule to obtain rough quantities of the material. Cement = 600 Bags (as for illustration). Sand = 2,000 cubic feet. Aggregates = 1700 cubic feet. Cement = 590 Bags (as for illustration). Sand = 1900 cubic feet. Aggregates = 1600 cubic feet. Cement = 570 Bags (just for example). Sand = 1800 cubic feet. Aggregates = 1500 cubic feet. To form thumb rule for every construction material, the average usage of every particular material should be selected. Now it is required to determine the quantity of cement that is used in 1 square feet area. Covered area = Material consumption. 1050 sft = 586.66 bags.. So 0.55 is fundamentally considered as our cement thumb rule. 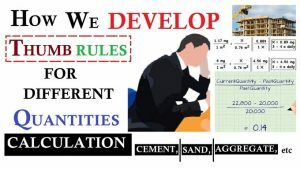 If it is required to work out the quantities of cements for 5,000 square feet area (if the conditions are identical), 0.55 should be multiplied with the covered area to obtain the cement quantity.